They will be mine, OH YES, they will be mine! Seriously, I've been wanting to test out Minx nails for months. Once Wendy B gave them her endorsement I was even convinced that they might be worth the splurge. Now that I've seen this device its only a matter of time until I find my salon and STRIKE. When you find a salon ask them how often the technician does Minx...you want to find someone with good experience. I've noticed that practice makes perfect when it comes to Minx. I've been curious to try them. I'm just still on the fence. Post a review!!! 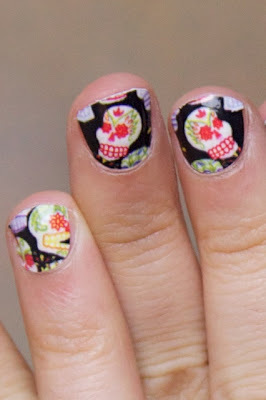 wow, googled sugar skull and found this picture. I've had my leopard print minx nails on for two weeks now and they're still going strong. Whilst I was in the salon I saw this design (it has to be pre-ordered in the salon I went to) and I'm gonna go get them done next month to go with my sugar skull dress for graduation. I'd recomend them a million times over!